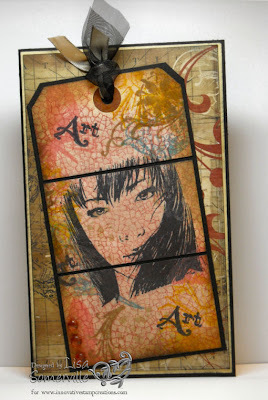 Designs by Lisa Somerville: Innovative Stamp Creations Challenge...Want to win FREE stamps? Innovative Stamp Creations Challenge...Want to win FREE stamps? I started off with a tag doing the Color Collage Technique (TJNL). To make the tag pop - I added some Brushed Corduroy and Black Soot Distress Inks to the edges. I cut my tag in thirds to give it a bit of dimension, layered on a black piece of card stock. My designer paper is from Heidi Swapp - again I added some aging to the paper - I sponged Old paper ink onto the white areas, then Brushed Corduroy and Black Soot to the edges. This is layered on a piece of So Saffron (that has also been aged) and then my black card base. To qualify for the FREE stamp sheet, you must use ISC images only and at least one tag in your creation. Upload your work to your blog or online gallery using the keyword ISCC1, then post a link to your project on the ISC Blog. A random name from the entries received will be chosen to win a FREE ISC Stamp Sheet of your choice! This challenge ends on May 25th. Good Luck! 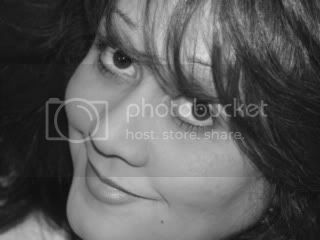 She'z beautiful! Very artsy...I'd be happy just winning your tag! Lisa, I just love your tag!! It is just besautiful, the color, the background, just everything!! Lisa, that is just beautiful! Oh my goodness what a GORGEOUS tag !!!! WOWEE that is one GORGEOUS TAG!! !